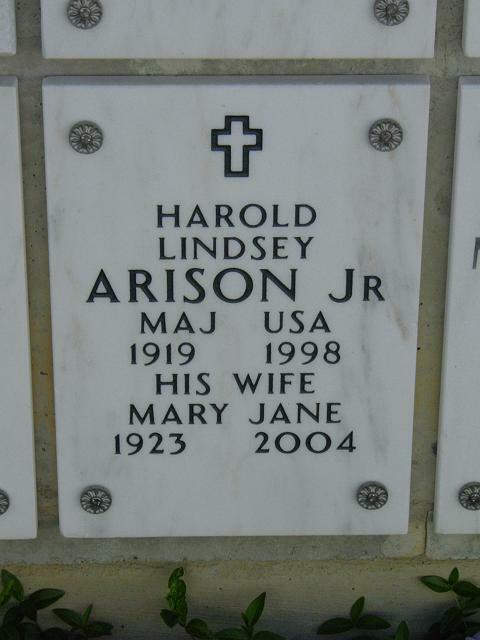 Harold L. "Lin" Arison, 79, a retired Army bandmaster and Foreign ervice officer whose musical accomplishments included the reworking of the Nationalist Chinese national anthem, died of cancer October 29, 1998 at a nursing facility at the Falcon's Landing retirement home in Sterling, Virginia. Major Arison, a longtime student of music, began his military career in 1941 as the bandmaster of the 357th Infantry Regiment. After a promotion to division bandmaster, he participated in the Utah Beach landing during the Allied invasion at Normandy, as well as in five major European campaigns while he was commanding officer of the 90th Infantry Division Band. He then became the commanding officer and conductor of the special services orchestra, conducting concert tours and providing entertainment for U.S. military forces in Europe. While an assistant bandmaster, composer and arranger at the U.S. Military Academy at West Point, he was lent to the government in Taipei, Taiwan, from about 1954 until his military retirement in 1963. There, he served as a music adviser, organizing and directing a music school for music teachers, bandmasters and instrumentalists. He also composed and arranged state ceremonial music for the government, which had moved to Taiwan in 1949 when the Communists rose to power in China. Among his achievements was the rearrangement and harmonizing of Taiwan's national anthem, a version that has remained unchanged. Upon his military retirement, he became a Foreign Service officer and had an assignment in Indonesia as a senior member of the U.S. Information Service staff. He later became chief of the Northeast Asia and Pacific branches of the Voice of America and adviser to the program director of Vietnam's national television directorate in Saigon, now Ho Chi Minh City. He retired from the Foreign Service in 1972 and worked as a management and communications consultant and as a contract and licensing administrator for an oil refinery firm. Major Arison, a McLean resident off and on for 31 years, was a native of Uniontown, Pa. He graduated from Penn State University with a degree in music education and took graduate courses at the Army Music School at Fort McNair in Washington and at Trinity College of Music in London. He was a member of the Delta Upsilon social fraternity. Survivors include his wife of 56 years, Mary Jane Francis Arison of Sterling; two children, H. Lindsey Arison III of Herndon and Mary JaneArison Heppe of Purcellville; and three grandchildren. A memorial service will be held at the Ft. Myer Old Post Chapel on Thursday, November 19 at 2 p.m. followed by inurnment at Arlington National Cemetery Columbarium. In lieu of flowers, memorial contributions may be made in his memory to The Hospice of Northern Virginia, 885 Harrison St., Leesburg, VA 20175.